It seems so boring but damn it is so tasty. 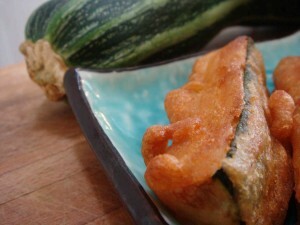 Nothing beats a great deep fried beer battered zucchini spear! For extra flavor I used a dark brown beer and whole wheat flour too. You can use any oil you like but you know I’m an olive oil junky, love that flavor! Mix the batter together with a fork or a whisk until it is smooth. Dip each spear into it and carefully deep fry. Have your oil on medium high heat, if you have a thermometer you want it to be at about 375 degrees. Fry the spears (only a few at a time) for about 5 minutes. Frying can be a pain sometimes, one big problem is over crowding the pan…if you add too many items (especially something frozen) the temp of the oil will drop significantly. Best to do a few at a time to get your groove on and test it all out. When your spears are golden brown, carefully remove them from the oil and blot on papper towels. Hit them with some sea salt and munch away. Sometimes I’ll have a little dipping sauce on the side too. 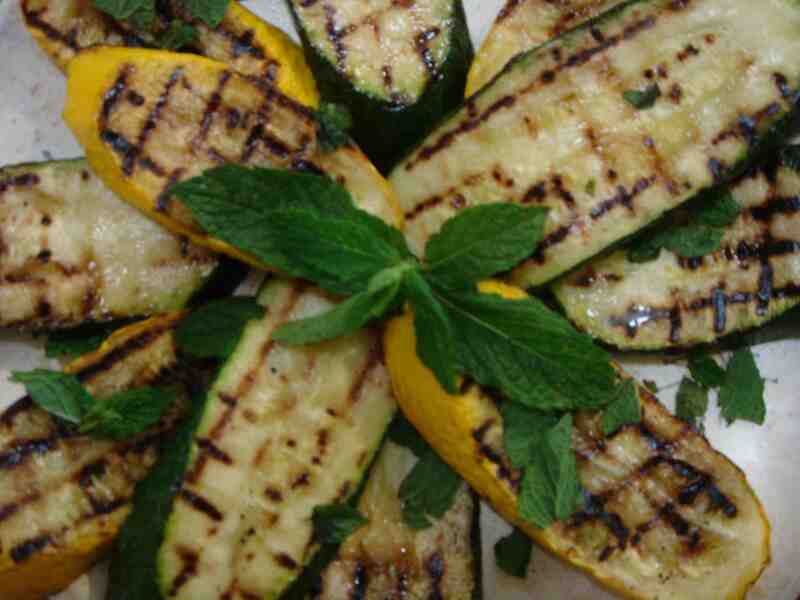 Great for fried, grilled or raw veggies! Stir all of these ingredients together. My main goal with this recipe was to show off how easy it is to make a raw pasta using veggies. 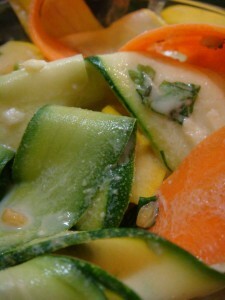 I used a green and a yellow zucchini and threw in a carrot as well. All you need to do is carefully cut slices out of each veggie using a vegetable peeler. You can use a mandoline too, but I really think a peeler works best for this. You can toss these ribbons with any sauce you want, marinara, vinaigrette, simple olive oil…or do something wacky like my Thai coconut sauce. This is sauce is kinda “farang”–the Thai word for foreign. But it’s good. And it’s easy. And it tastes really great with the raw pasta so rock it! Mix all of your ingredients together in a bowl and beat with a wisk or a fork. Toss the sauce onto your veggie ribbons and enjoy. 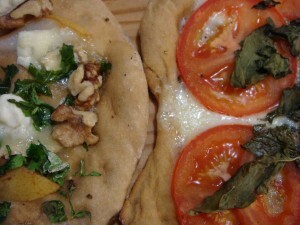 You can add other veggies to this too, a little shallot and cherry tomatoes are nice. Simple and tasty. The classic, easiest and perhaps tastiest way to showcase zucchini! Like I said on the show, this is so easy I don’t even need to show you how to do it. 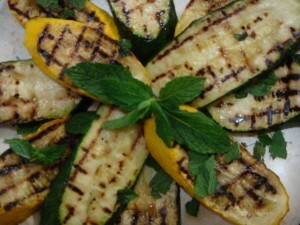 All you gotta do is cut your zucchini into slices about a third of an inch thick. Brush each side with a little olive oil, hit it with salt and pepper and grill each side for about 2 to 3 minutes until you get some nice grill marks. 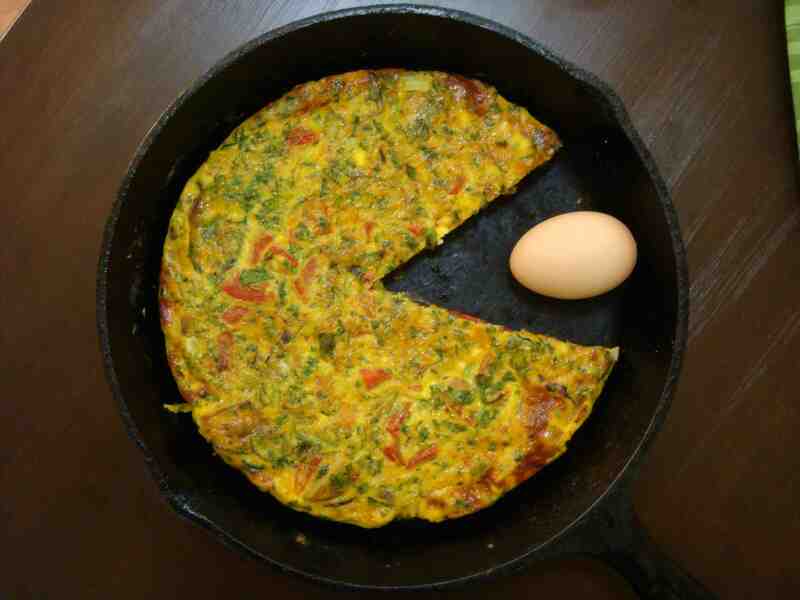 You can do this in a hot skillet too. I threw some torn mint leaves on my zucchini but any fresh herb will work. A little drizzle of extra virgin olive oil and some finishing sea salt and you have a great dish on your hands! I went backpacking in Rajasthan India for that whole Y2K thing. It was still 1999 when I trekked to a town named Sawai Madhopur to visit a natural preserve in the hopes of spotting tigers. Though I never saw any cats, I had an amazing breakfast at guesthouse: MASALA OMELETTES! I rebranded that omelette into this thick and fun frittata, enjoy! In a big bowl beat the eggs and add all the ingredients, expect the potatoes. Stir to incorporate everything well. Get an oven-safe, nonstick pan and heat it up on medium heat. A little oil or butter to just coat the bottom and the sides. Add a layer of your potatoes. Sometimes I’ll go ahead and cook raw potatoes in the pan on the spot. This takes several minutes and so, being the impatient guy that I am, I usually use some leftover spuds from a previous dinner. Any type or size of potato will do, but I recommend cutting them into manageable, bite-sized pieces. Pour all of the eggs into the pan and let them set. I usually run a spatula or a fork around the edges just to keep them from sticking and help me monitor the progress. When you feel that the bottom (and sides—any surface hitting the pan) has set and cooked and the top is still runny, it is time to broil the sucker. Pop the pan under the broiler (or a super hot oven) and let it cook for about five minutes. When the top is firm and a little golden brown you are good to go. Serve this with a salad for a great breakfast, brunch, lunch or dinner. Namaste!